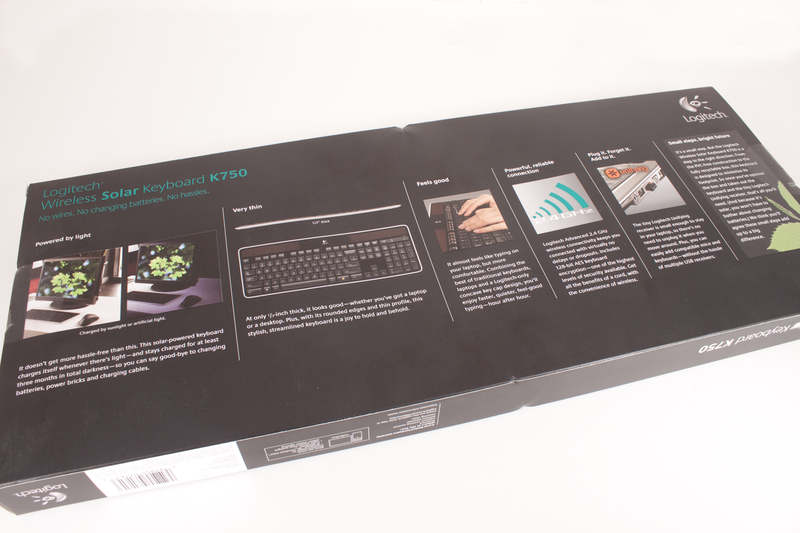 The box that the K750 comes in looks like most other keyboard boxes. 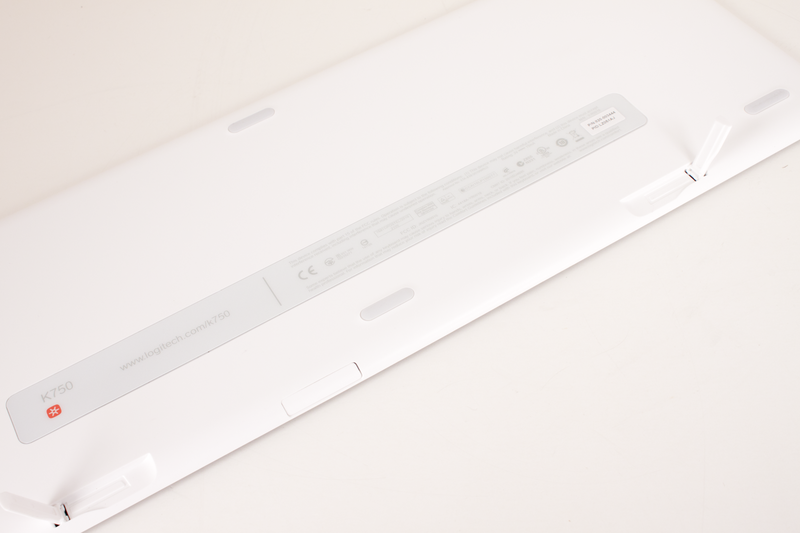 It is long flat and as is typical it has a picture of the Keyboard right on the front. In other words it is boring. The only thing that makes this product stand out is the solar tag on the front. 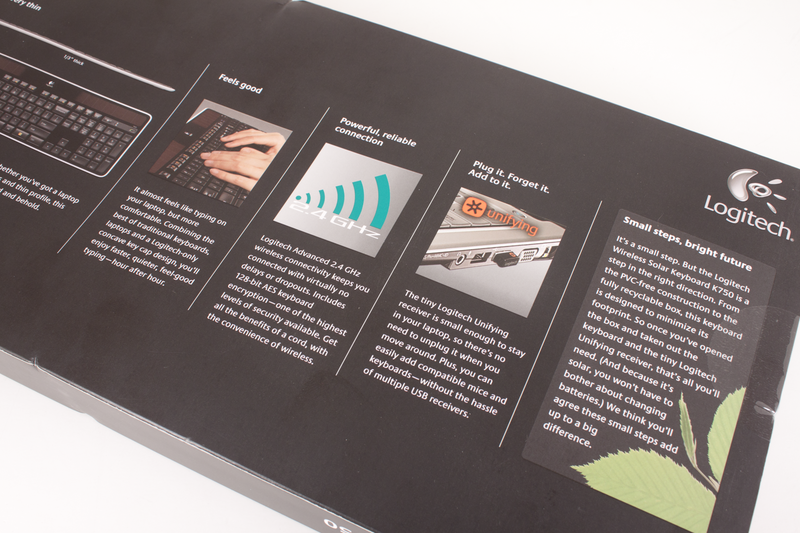 The back of the box is much more interesting and offers significantly more information on what the K750 is capable of. One of my concerns when I picked the K750 up was that it was going have to have a strong light source in order to keep a charge. The back of the box had something that had me less worried; according to the box information it can charge from natural sunlight or from artificial light and the battery can maintain a charge for an estimated three months in total darkness. Besides that bit of information we find out that Logitech is supplying you with a wireless receiver that can work with other Logitech devices meaning that you do not have to use multiple wireless dongles to keep everything running. 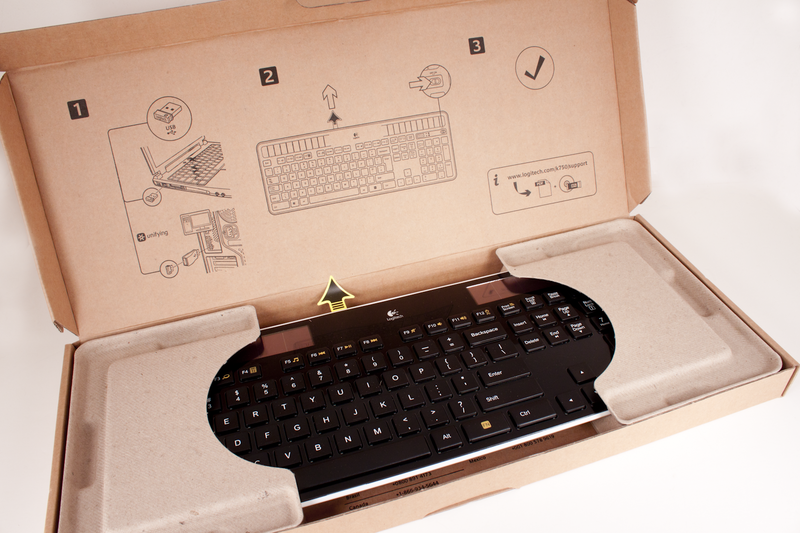 Inside the box we find that the K750 is wrapped in recycled cardboard and almost no plastic. 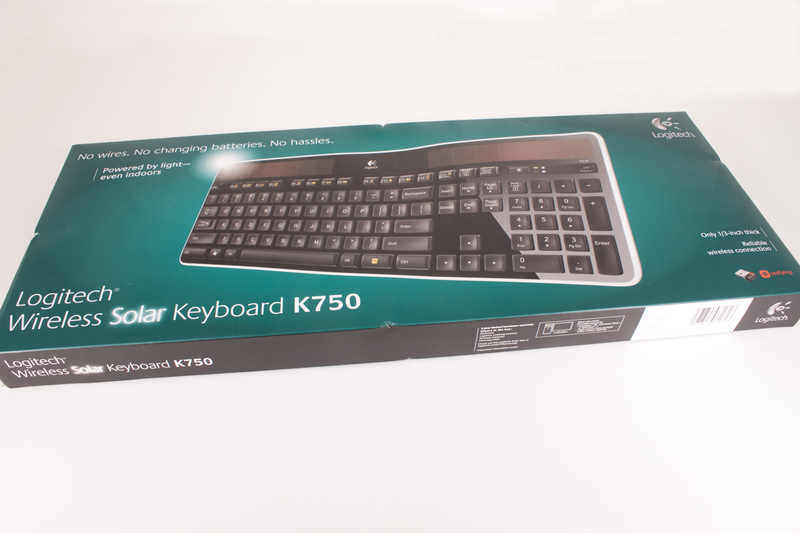 The only plastic in the box is the covering that protects the glossy surface of the K750. Not a bad start on going green for this product. Inside one of the end caps we find a cleaning cloth and the miniature wireless dongle. For those that want to use this with a desktop Logitech has also provided and extender to make sure that the receiver is far enough away from the case to get a signal. Curiously enough there is no CD or DVD rom with setup files. I guess we will find out more on that later. The K750 is long and VERY thin, it is only a .33 inched thick. 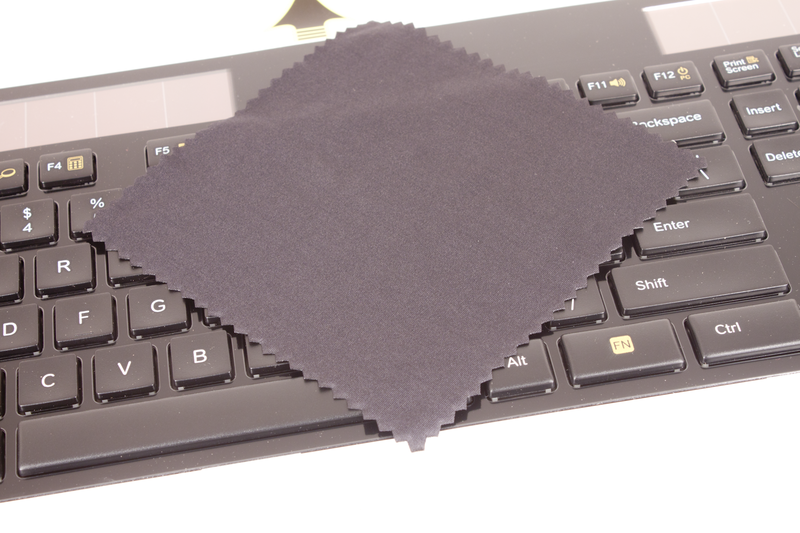 The keys are the Chiclet style keys that are becoming more popular on laptops. 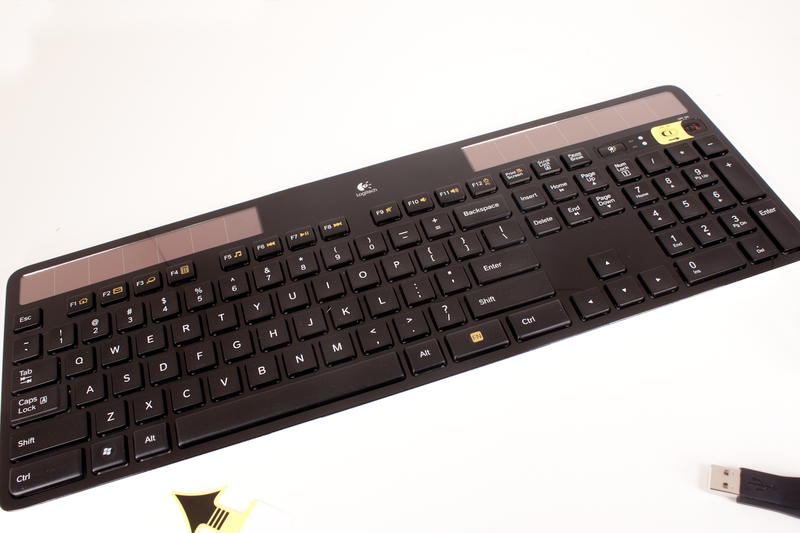 This is actually one of the advertising features of the board Logitech states that it “almost feels like typing on your laptop”. This is partially true; while the keys have a very short throw they are a little more stiff and clunky than the average laptop keyboard. 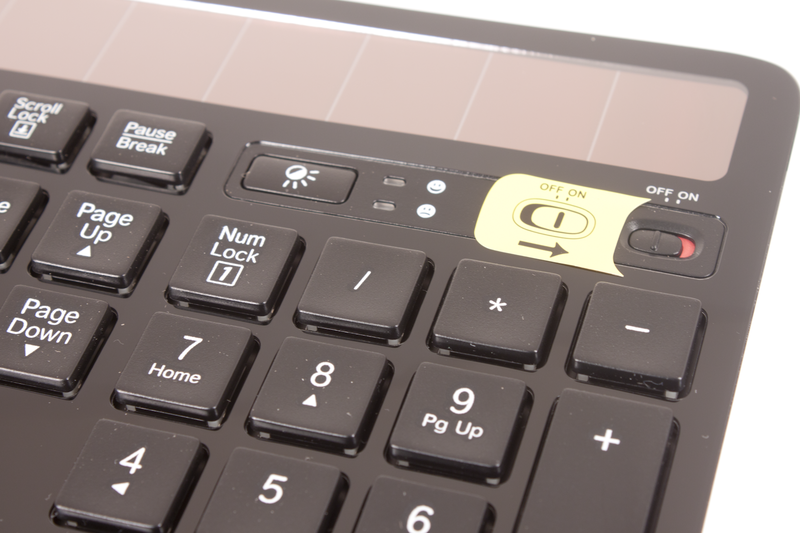 Along the upper edge of the keyboard are two seven panel solar cells. These are well placed and also appear to be very high quality (although small in size). The cells are responsible for keeping the K750 charged and can even charge off of nothing but the light of your monitor (more on that later). All of the keys that you find on a typical keyboard are here with a few extras. 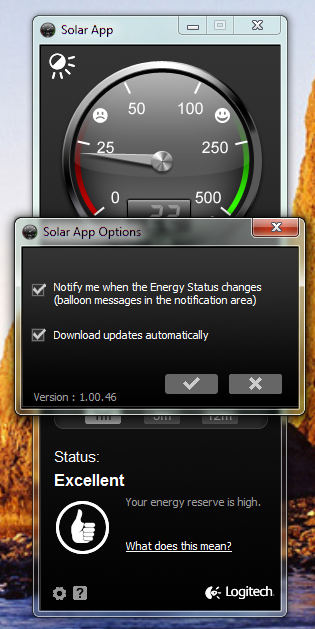 One is the on/off button and the other is a button that starts up the Solar App utility that we will talk more about later as well. Flipping the keyboard over we find two very thin and flimsy looking legs to give the K750 and angle for easier typing. I personally would not use these are they look like they would snap at the first really hard impact or if the keyboard was pushed too hard and the legs came into contact with something solid. There is also what appears to be a battery compartment. At least there is a tab here that has to be pulled before you can use the K750. However, we could not find a way to open this up without damaging the keyboard. In all the K750 is a well put together keyboard (with a couple of exceptions). The K750 comes with no software, however (and this is a little scary to be honest). 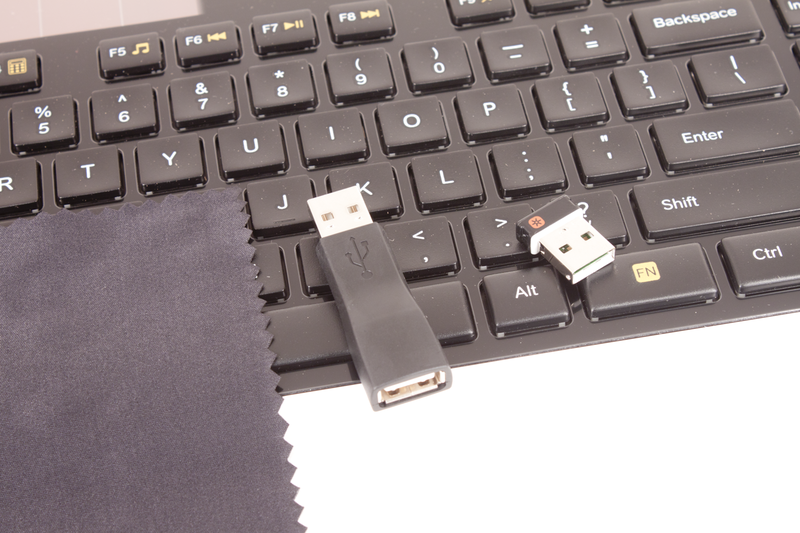 When you plug in the dongle it connects to the internet and downloads the drivers as well as a utility that lets you keep track of the amount of light your K750 is getting and can also let you check on the charge in the keyboard’s battery. There is even something of a historical graph to see how well things are keeping up. As we mentioned we killed all the lights and just maintained the monitors we use to see if that was detectable by the K750’s sensors. Surprisingly enough even the 14 lux of light coming off of the monitors is enough to keep the K750 charging. Now that is impressive. The K750 has a nice feel to it, but it is one that takes a little bit of getting used to. For a long time I used an ergonomic keyboard so going back to a flat keyboard was something of a change. That did not stop me from getting the hang of the K750 in only two articles. It really is comfortable to use and easy on the fingers as well. The controls are well placed and intuitive. The reception on the dongle was something of a concern until I put it into the extender that Logitech included. The solar charging was simple phenomenal; I am still at a loss that you can charge this thing with nothing more than the light coming off of the monitor in front of it. 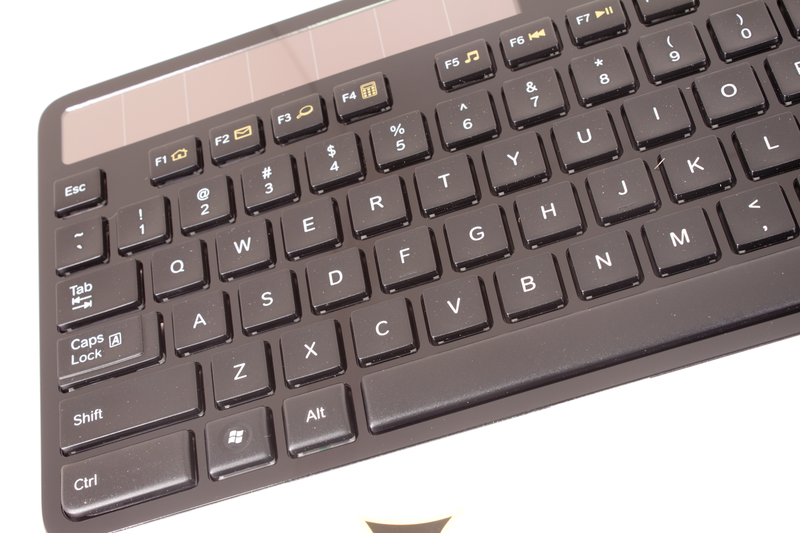 The function keys at the top of the board are handy and while normally I would not find much use for them I did find myself playing with them during this review and the other one that I wrote for this review. For gaming I found the keys to be spaced well and also responsive to touch I took the K750 through Medal of Honor, Portal 2 and even a few levels of Crysis 2. The K750 simply had a great feel to it whether typing, gaming or anything else. My only complaint is that it is a bit noisy; I think that Logitech could have made the keys a little more quite than they are, but the noise is not so bad that I would not use it. As I mentioned at the beginning of the article the K750 retails for $79.99. That is pretty steep for a keyboard even if it is one that is as nice as the K750 (and throws in solar power to boot). However when I hit the Staples there was a sale on this product that knocked $20 right off the top. For $59.99 this keyboard was a steal. I mean it is quick comfortable easy to use and I will never have to replace the batteries again! Think about how much that will save you over the normal 2-3 years that a keyboard should last. Not that bad of a deal now is it? In fact even at $79.99 it is not all that bad really. I have absolutely no buyer’s remorse over this purchase. It is one of the better keyboards that I have picked up. I normally am very picky about my keyboards and mice I have had more than a few that I have bought only to give away or just put out in the garage. 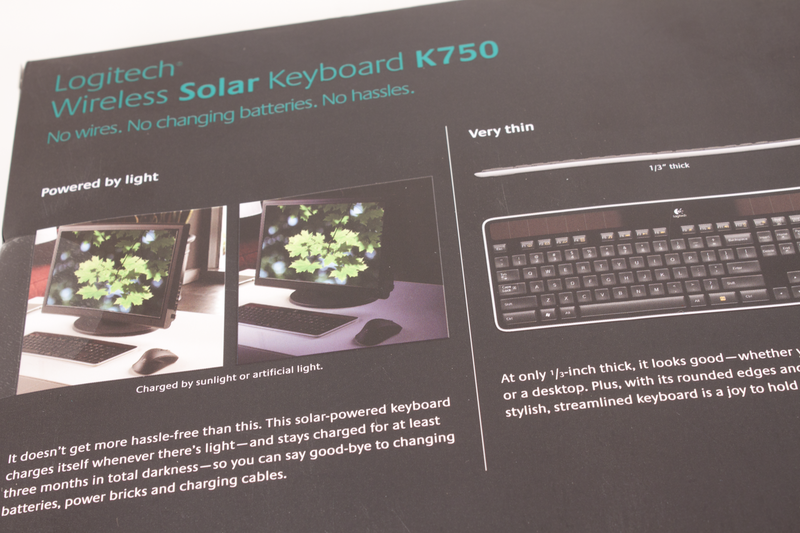 The Logitech K750 Solar Keyboard is one nice keyboard that offers not only performance and comfort, but also has the added benefit or bringing a little bit of green into what is normally not so green at all. If you are looking for a new keyboard even one for gaming the Logitech Solar Keyboard K750 certainly gets my recommendation.